Hillview01263 715779work01603 870304fax Self-cateringThis pleasant flint and brick single-storey property is only a short walk from the beach head. Approached by a long track, the accommodation is surrounded by natural beauty and guests are able to relax in the large and pretty garden. Visitors can make the most of the local village's tennis courts, playground, shops, eateries and pubs. Furthermore, those with a taste for adventure can take a boat trip from the quay to view the amazing wildlife. Hillview is a brick and flint detached property, all on one level, just a five minute walk from the quay. It is situated at the end of a long drive, in a peaceful location with a large attractive garden. 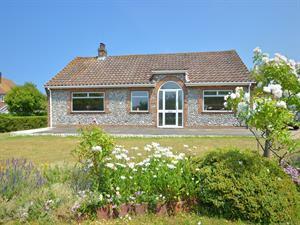 This pleasant flint and brick single-storey property is only a short walk from the beach head. Approached by a long track, the accommodation is surrounded by natural beauty and guests are able to relax in the large and pretty garden. Visitors can make the most of the local village's tennis courts, playground, shops, eateries and pubs. Furthermore, those with a taste for adventure can take a boat trip from the quay to view the amazing wildlife.